"Going Gaga for G and A"
Most books that teach reading staff notation for guitar start with two or three notes on each string, all in the first position. The first position is defined as the open strings and the notes on the first four frets. 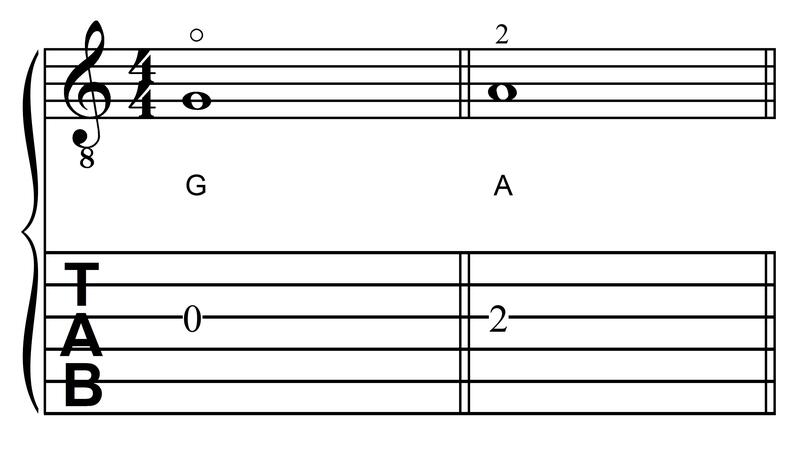 The two notes that are on the third string are G and A, located as shown below. Make a point of using your second finger to fret the note A at this point. You can use a different finger later if the context calls for it, though the second finger is used most of the time for the note A. To help you learn these notes, try playing the following piece, "Going Gaga for G and A". There is an audio file located below the music that includes an accompaniment track and the guitar part. If you are listening in stereo, you can hear the guitar part on the right channel, and the accompaniment on the left channel. If you wish to listen to only one or the other, adjust the balance all the way to the right or left. If you wish to hear both parts, set the balance to the middle. Remember to count one measure of rest before you begin. You'll hear pizzicato violins in the first measure before you start playing.